More than 20 years of experience in various facets of branding and communication helped Xavier establish himself as a brand. A leading global thinker and expert on communication and PR, Xavier Prabhu often speaks on topics ranging from entrepreneurship, social media & digital communication, branding and PR. Many people who have worked with him describe him as a visionary, a leader who lets you grow on your own, inspires you to work smarter and deliver better and become a visionary one day. Currently, Xavier is the CEO of one of India’s leading and independent full services communication firm PRHUB. 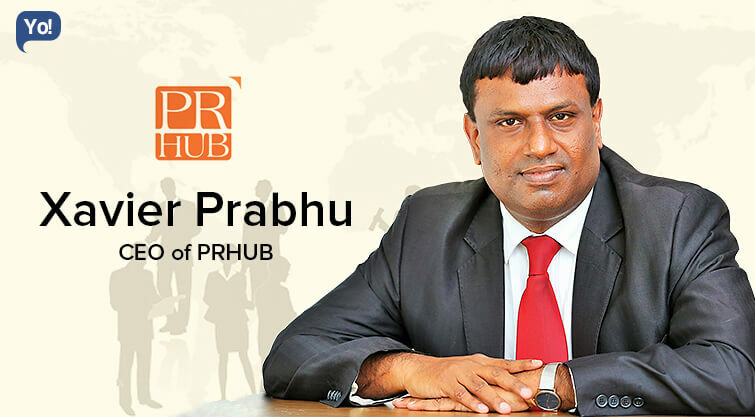 He spearheads PRHUB’s growth as a national firm, besides internally mentoring and developing a strong leadership team. Xavier plays a pivotal role in driving strategy, negotiating with customers, and mentoring a team of enthusiastic professionals. The not so flattering and truthful answer to this questions is – none. I got into offline PR as a rebound after my online PR venture failed and was clear about not becoming an employee again. But my biggest and original inspiration behind entrepreneurship is to build at least one institution that lasts much beyond me besides creating enough wealth to fund a non-profit foundation. Actualization and the opportunity to impact/change lives. Through the current venture and others that am part of and will get into, in the future, have an opportunity to contribute and change lives of employees and others. Through the non-profit foundation planned that process will focus and more thrust. Also do a lot of teaching and speaking to do my bit. Actualization is a personal driver. To be a more holistic, balanced and responsible human being who utilize his potential to the fullest. There have been challenges – major ones at multiple stages of my journey. We erred and got lured by a greedy landlord into having our office in a co-operative housing complex which turned messy, legal and almost wiped us off. By the time we recovered and started growing, had a critical issue with my father’s health which meant lesser focus on business for over 2 years. The first one was sheer carelessness on our part and the second one was a clear choice by me of trying to balance the professional with the personal and am happy since my father survived and is healthy now. The real challenge as I begin a fairly clean phase now is internal drive, focus, discipline, determination etc. By nature, my levels of drive, energy and determination are higher. But as I push myself, am figuring there are even more levels to go of discipline, determination etc. It is about relentlessness. Sheer grit and determination and ofcourse blessed to have couple of people in my life who are of great help and support on both personal and professional sides. I personally find, in the larger scheme of things, over longer timeframes, it is really the individual’s relentlessness, discipline and focus that matters and the quality of core team he or she built around themselves. Rest is all details and milestones in the journey. If one adds passion on top, you then have the answer. It is largely internal accruals and bit of debt till now. and only later this year, we will seek strategic investments. we have been profitable all along and growing each year except for 2 years in between. so certain level of growth and expansion does not need any external investments. but things are different for the new venture we have floated for digital and social and the other start-up venture am planning in another month or two. There is no protection one can have from brain drain. Many of today’s employees are focus-less themselves and disengaged so whatever you do as an organization it is of little help. and the next big issue we still don’t have lots of quality middle managers which weakens or prolongs the process of culture building which is the best and most effective tool against attrition. We have unique initiatives like I believe – an inspirational campaign and many others. Consistency, determination and focus. not in any particular order but all equally important. Success does have a luck dimension to it – being there at the right time with the right thing. But that is rare and only exceptions. Rest all have one or more of these attributes. Consistency is equally important. It means being the same at various stages of your evolution and success and retaining the same values. So people around you need not change their equations all the time based on your evolution. it is very important and makes it comfortable for people to do business with you and creates an image of reliability. I am not that tech-savvy, but outlook calendar and invite helps manage my work schedule well. Unless i am sounding archaic, becoming better at using Google docs for collaboration as well. Use skype quite a bit, webex and like ilk once in a while as well. There are couple. I make it a point once every six months to just call most business contacts in my phone. It is very effective and a lot of the business relationships are built out of this one habit. have been doing this for 15 years now – a bit here and there but at it. Other is being curious and observing everything that happens around me. It helps me to generate ideas more quickly and suggest solutions that are grounded in insights that come out of these observations. Anger/loosing control. It is not healthy for those around and myself. Also at my level, having this happen in issue meetings with senior people from other companies or organizations is also not good either. I am better than before and I know it will be a while before I get to mastering this completely. Don’t chase it or have it as a goal. Have some other larger goal and then chase it with passion and relentlessness. success is a obvious by-product or trappings of success. Being constrained by their own perception of themselves and circumstances. you don’t know what you are capable of or made of.. Success is very personal, individual and it is something transient. It is not a life goal or even a good goal to have. Being of meaning and impact to those around you and larger society in some manner is far more important. Also important in the process is one’s own actualization and growth. Take PR/integrated communication firm to the next level. Scale the social and digital venture rapidly with my partner in that venture. Take my new start-up idea to series A funding. start the building blocks of the foundation and other long-term things that plan to do for the next 20-30 years. Won’t change the career sequence. But definitely would have wanted to study something else other than solid state physics and quantum mechanics. Europe, South America and parts of Asia. Mountains, forests, heritage, beaches and adventure destinations. I am an avid traveller (18 countries already and many more to go).